See the famous Swaledale Wild Flower Meadows in June! Wonderful Walks and Waterfalls to explore in Swaledale, or simply just relax in tranquil Thwaite! 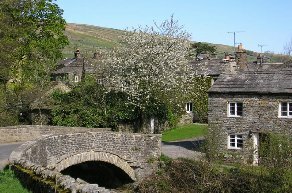 Our cottages are situated in the pretty village of Thwaite in Upper Swaledale, at the foot of the iconic Buttertubs Pass, just over the hill from Hawes, in the heart of the Yorkshire Dales National Park, in an area of outstanding natural beauty. 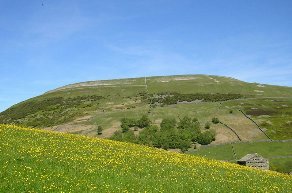 The Pennine Way, James Herriot Way and Coast to Coast walks pass close by and cyclists can follow the route of Le Tour 2014 or try out The Swale Trail. The Hunter family have been offering cottage holidays in Thwaite for over 50 years. The present owner lives in the village and is available for that personal service. Thwaitedale Cottages are an ideal base for walking, cycling or simply relaxing and enjoying the Yorkshire Dales. The holiday cottages are fully equipped for self-catering and have the added benefits of bed linen and towels provided, full central-heating and utilities all included, with a wood-burner or open fire, if needed, to come home to after a day out in the Dales. Private off road parking & storage is available for bikes. Book your property for a holiday for 2, romantic retreat or friends and family holiday. Reduced rates for couples, see the dropdown menu on the Availability Page. Weekly or longer lets or short-breaks, the choice is yours. Swaledale is famous for its sheep, traditional dry stone walls and haybarns. The protected wild flower meadows burst into colour in May and June, with rich Autumn hues from September onwards. It is a beautiful dale with many hill streams that tumble and cascade over waterfalls, and is a magical place to be when the early evening light changes across the hills, with nothing but the sound of birdsong. If you fancy a drink or a meal out, The Kearton Hotel in Thwaite provides good food, book in for Evening Meal, or call in for coffee, lunch or a drink. The Farmer's Arms pub in nearby Muker offers good beer and bar meals. It's only one mile walking across the fields or by road. Tan Hill Inn, the highest pub in England is only 6 miles away. There are pubs and teashops in most villages in the dales. Ghyllfoot at Gunnerside or Humble Pie & Guy at Askrigg make a range of tasty bistro meals for a night in with no cooking!